For those who don’t follow me in the social networks, I’m now a co-organizator of the GDG Vigo (Google Developers Group), founded by Reinaldo Aguilera. In this group we are organizating a lot of interesting (and free!) Android and HTML5 activities (speechs, codelabs…) near Vigo, Galicia. Join to our Google Group and stay tuned! 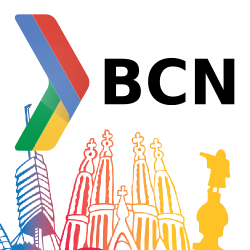 This year I also went to the Barcelona DevFest, but as GDG Vigo we tried to help with the organization. Thanks Google, GDG Barcelona and GDG Tarrragona for the organization of such great event!